I'm thinking some really hard braking would settle the front down. I'm doing "progressive" alignments at home after almost every drive, as the car finds its new final ride height after springs/shocks. Have some new learnings and hints to add to the DIY alignment thread when it's all settled out. Even with the car initially settled on loose bushing clamps, the last ~5mm of front height is taking a while by the "drive-it" method. I'll end up around 175mm in front, with the Eibachs and the front adjusters as high as they will go. Really, what shocks? I just installed a set of Bilstein-Eibachs on a buddy's car and set the front adjuster so the bottom was even with the end of the threads (still have about 6-7 turns to bottom out) Right now it looks like I'm aroud 175mm and I think it still has another 5mm to go. I've only driven it about 10 miles. After it's completely settled, then I'll do a 4-wheel alignment. I met a 928 fellow at the track who set his car up without rubber bushings. Claims the ride height settling problem is no longer an issue. I supposed we could eliminate the rubber bushings. That would make the settling issue go away. But the rattles and banging of the control arms bouncing in the collars would be annoying at best. Plus alignment would be, uh, inconsistent. I think we still need bushings in there of some sort. Certainly a steel sleeve on the arm and a bronze sleeve in the collar would make a nice greasable low-deflection low-friction arrangement. Or just make a new LCA from steel tubing and use spherical joints that could be replaced easily every session or two. Not really durable enough long enough for regular street duty, IMO. There seems to be some errant Eibach springs around. The ones from Roger (originally from 928Intl) seem to be the ones that require the adjuster nuts on Bilstiens to be near or at the top of the screw thread for 175mm ride height. seemed to have bought some that were too tall requiring the adjuster nut to be at or preferably lower than the bottom of the threads. I don't think he revealed where the springs came from. Really, what shocks? I just installed a set of Bilstein-Eibachs on a buddy's car and set the front adjuster so the bottom was even with the end of the threads (still have about 6-7 turns to bottom out) Right now it looks like I'm around 175mm and I think it still has another 5mm to go. I've only driven it about 10 miles. After it's completely settled, then I'll do a 4-wheel alignment. I have new Boge/Sachs low-pressure shocks from Roger's hot buy last summer, with the Eibach springs from Mark A's group sale this past spring (!). 17" wheels with 225/40 PS-2's. I started out with the front adjusters as you describe, bottom edge of the threaded inner sleeve flush with the bottom edge of the adjusting sleeve. I'm now up 5 full turns, and the front of the car is at 173mm right now after maybe 40 miles of casual in-town driving and 10 miles of running over local speed bumps at 25. I figure I might have another 5 full turns available, and stil have 1/3 of the threads on the sleeve engaged. If it needs more I'll figure out some rings to go between the adjusters and the spring seats. The rears are up 35 full turns to get original height OK. I have new Boge/Sachs shocks from Roger's hot buy last summer, with the Eibach springs from Mark A's group sale this past spring (!). 17" wheels with 225/40 PS-2's. I started out with the front adjusters as you describe, bottom edge of the threaded inner sleeve flush with the bottom edge of the adjusting sleeve. I'm now up 5 full turns, and the front of the car is at 173mm right now. I figure I might have another 5 full turns available, and stil have 1/3 of the threads on the sleeve engaged. If it needs more I'll figure out some rings to go between the adjusters and the spring seats. The rears are up 35 full turns to get original height OK. So Doc... how do you like the boge/eibach combo? what the heck was that????? did you cut the springs, 1.5 coils up and not use anythng to compress it before hand????? now, cut out the remainder, and compress the spring, and rotate the purch to match the new "end" of the spring at the bottom. you might be pretty low now, but it should work. match the other side, but cut it by also using a spring compressor of some kind. The ride is firmer certainly with the new springs. I liked the stock ride quality, but figured the mild change in spring rates to the Eibachs would keep the car a little more settled in the corners when there's a bit of camber or elevation change mid-corner. A bit less floaty if you will. The new springs easily meet that goal, without a significant penalty in boulevard ride. Keep n mind that we live in an area where there are no frost heaves in the pavemnt, and relatively few potholes. The stock original almost-100k shocks that came out could be cleaned and resold as new. Doing the manual gas purging prior to installation, I tested the old against the new and found almost no difference. 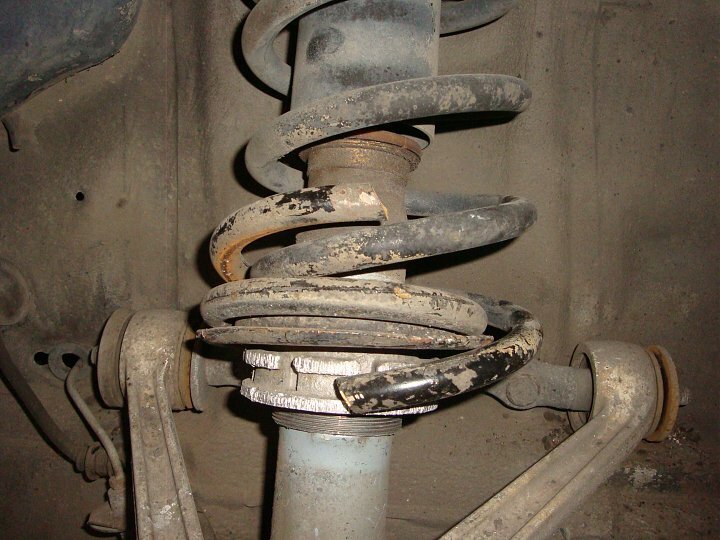 Guess I didn't drive the car hard enough before to wear on the shocks much. Pretty much all the change in ride and handling I attribue to the spring change. I've ridden in several cars with various tire, spring and shock combos, all but one with the suspension sagged and not corrected. All of them seemed harsh compared with mine, so I was careful/concerned about changing anything. The owners of those cars seem to equate harsh ride quality with sports-car handling, and so look on the banging and crashing noises as a plus. I've picked up some stability and firmness without adding to any harshness or suspension noises, so I'm claiming success. I also have 17" wheels with Mich PS-2's on the car, a combination that is much easier on the ride than the others I've ridden in. Keep in mind that my 928 driving experience is extremely limited in other cars. I've ridden or driven in less than half a dozen cars besides my own, so I may not have the broad reference set that others have. Anyone in the greater SoCal area is more than welcome to take a test ride and get a feel for the car with the new setup. Good to hear. I've got a set of eibachs that I was waiting to install until I got some bilsteins, but figure I've got more important standard bits to replace first so may as well bolt them in. My boges are fairly fresh and wondered if they could keep up with the stiffer springs. Thanks for the info.